Cauliflower CAKE??? That's what I thought when I read the recipe title from Ottolenghi's newest cookbook, Plenty More. But I know from experience to trust Ottolenghi - if he says a recipe is worth making, it's definitely worth making. And he was right, once again. 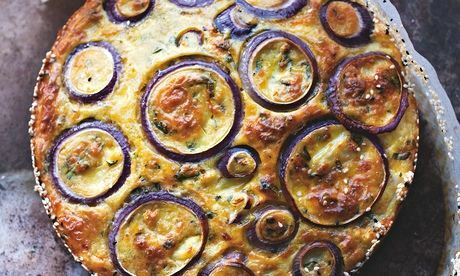 This savoury "cake" (really more like a quiche) is irresistibly delicious! All I had in my fridge was a head of cauliflower and some uninspiring staples.... and somehow this was transformed into an incredibly flavourful vegetarian main dish. I think that's the true beauty of this recipe - how simple it is. And how unexpectedly flavourful it is. Recipe copied from here (excerpt from Ottolenghi's Plenty More). I didn't have all the ingredients so I put my substitutions in brackets. Though I do believe the recipe would be even better with fresh herbs, it was utterly delicious using dried herbs as well. Heat the oven to 200C/390C/gas mark 4. Put the cauliflower in a saucepan and add a teaspoon of salt. Cover with water, bring to a simmer and cook for 15 minutes, until the florets are quite soft: they should break when pressed with a spoon. Strain and leave in a colander to dry. Cut four round 0.5cm slices off one end of the onion and set aside. Coarsely chop the rest of the onion, and put in a small pan with the oil and rosemary. Cook for 10 minutes on a medium heat, stirring from time to time, until soft, then set aside to cool. 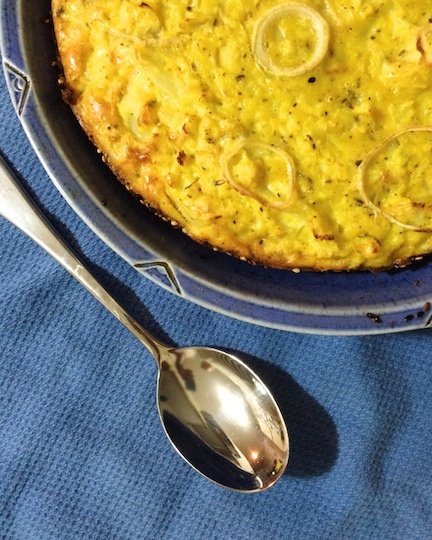 Transfer the cooked onion to a large bowl, add the eggs and basil, whisk, then add the flour, baking powder, turmeric, cheese, a teaspoon of salt and plenty of pepper. Whisk until smooth, then add the cauliflower and stir gently, trying not to break up all the florets. Line the base and sides of a 24cm springform cake tin with baking parchment, and brush the sides with melted butter. Mix together the sesame and nigella seeds and toss them around the inside of the tin, so they stick to the sides. Tip in the cauliflower mix and arrange the reserved onion rings on top. Bake in the centre of the oven for 45 minutes, until golden-brown and set: a knife inserted into the centre of the cake should come out clean. Remove from the oven and leave for at least 20 minutes before serving: it needs to be served just warm, or at room temperature, rather than hot. Your work is very impressive, I like it very much. Yes, I think I found a good and interesting story.